Portsmouth International Port was proud to take delivery earlier this year of a ‘state of the art’ new linkspan from Ravestein BV. A linkspan is very simply the floating link between the ship and the port itself. The range of tide in Portsmouth is 5,1m. It is unusual for any two ships to have exactly the same freeboard (height above sea level) and therefore the link-span must be fully adjustable for height. Whilst the linkspan and ship will both be prone to the same tides, the linkspan itself must be built such as to be afloat at all times but also have sufficient buoyancy to support the discharging cargo of freight and passenger vehicles. ​​The heights of High and Low water are therefore critical. For normal operations, the seaward end of the linkspan is supported on a buoyancy tank capable of supporting the ‘dead’ load of the bridge, upper deck and tank structure and the additional ‘live’ load of any one of the following vehicular loadings. * 2 lanes of HGV Vehicles on the top and bottom decks simultaneously. * 1 lane of loaded, 85t MAAFI units/Cassettes plus one lane of tugs returning empty on the lower deck only. * 1 vehicle of 45 units HB loading (180t) on the lower deck only. Thanks to PECS, the linkspan has been made using steel of a higher standard and quality in order to give it a 30 year life cycle instead of the more usual 20 years. 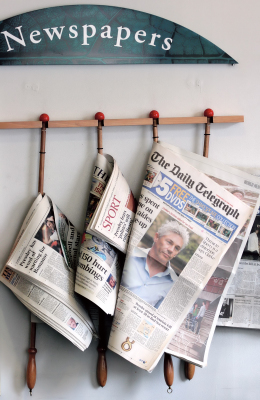 Ravestein BV were asked to quote for those carbon saving technologies that could be incorporated into the design. With no roof and adjusting angles, solar panels were wanted but not able to be operated efficiently. ​The double decked linkspan will be used by Brittany Ferries’ new gas powered vessel, the Honfleur, when she enters into service next year. 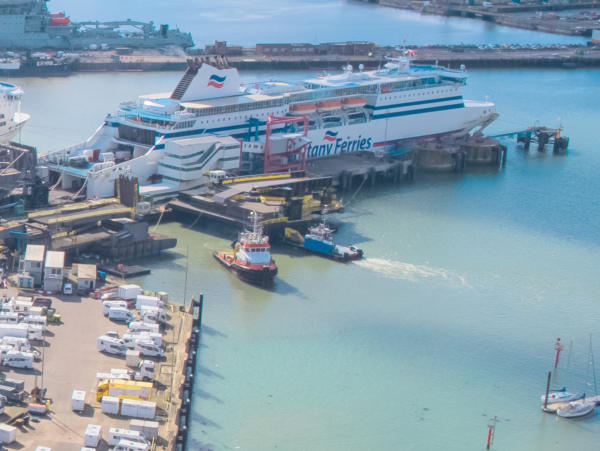 The larger environmentally friendly ferry will serve the popular route from Portsmouth to Caen. 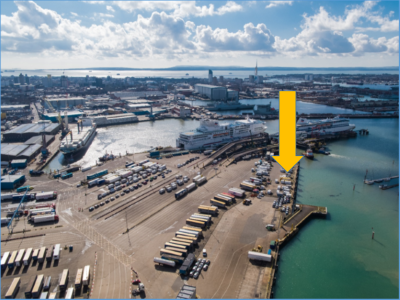 ​The International Port consists of 5 RO-RO berths and 2 commercial berths situated at the North Western side of Portsea Island on 14 Hectares of land. The challenges of reducing the Carbon footprint of a unit that customers required to be larger, heavier and quicker than that which it replaced, were great. 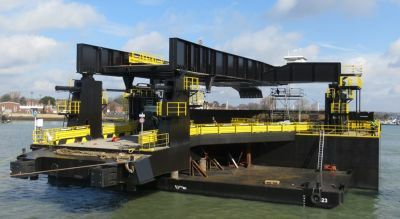 The new linkspan, designed and built by Ravstein BV (who also incorporated the new technologies requested), is a unit 400 tonnes heavier than its predecessor that takes more weight and operates more quickly. Critically this allows a greater amount of time for the ship to make her channel crossing allowing for fuel savings and reduced carbon production. The removal of one linkspan and the delivery and fitting of a new one is not an easy feat of engineering and required perfect planning and the adoption of fall-back positions should everything not going to plan. This included the provision of a mobile crane capable of lifting 700 tonnes available in case the tide height on the day was insufficient to lift the old linkspan off its bank seat. In the event the pontoons (that were filled with water to allow them to access the underside of the old linkspan and then had the water pumped out) had sufficient buoyancy and height to float the old linkspan off the bank-seat at the next High Water. ​This picture depicts the delivery tug 'MS Vigilant' (in red) standing-off from the newly delivered linkspan. Simultaniously a local multi-cat pushes up against the unit as it is secured in its temporary position awaiting the removal of the old linkspan (seen to the left of the picture). Despite build, delivery, testing and operation, the new linkspan is subject to much ‘snagging’ work before final acceptance. The largest ‘snag’ has been the upper deck hydraulic rams which have proven to be unfit for purpose and were replaced in June 2018. Until all ‘snagging’ has been completed and the engineers have accepted the new linkspan, the important work of measuring energy use by the new linkspan cannot yet be accurately measured. * Higher Quality Steel to Standard S355 giving the linkspan a life of 30 years rather than the normal 25 years. * Soft start’ electric ballast pump motors requiring less energy. * A paint system that should last for 20 to 25 years. * A water ballast system for raising and lowering the tank rather than the fast air-blower system it replaced.